First of the edition #1 - Extremely Rare. Size : 22 5/8" x 42 3/8". Signed, Hand Numbered & Embossed. Feel free submit offers, all offers will be considered. Please message me with any questions. 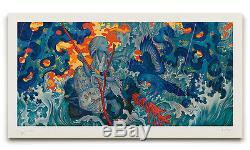 The item "JAMES JEAN ADRIFT 2015 Limited Edition Art Print Poster Signed #/d New Mint" is in sale since Tuesday, August 23, 2016. Size Type/Largest Dimension: 22 5/8" x 42 3/8"